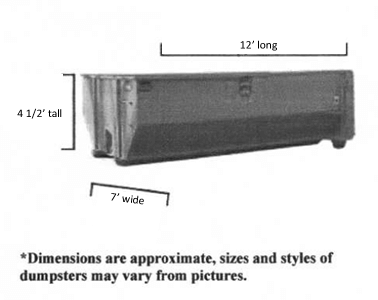 Dumpster Sizes: What size dumpster do I need? Television Shows like "Hoarders" and "Clean Sweep" have made cleaning out junk popular. Because of these shows, dumpster rental has become a new trend in cleaning. Finding a dumpster can be an affordable and convenient way to rid your home of debris, and it is no longer reserved for just construction sites. By renting a dumpster, you can clean out your project on your time frame. There are many dumpster choices available, and finding the right size for your needs can seem overwhelming. Let us help you choose the right size dumpster for your project. This 15-yard roll-off dumpster container is perfect for any site; especially when space is limited. The 15-yard dumpster rental is great for residential sites, commercial sites or even when you want to clean out your garage. This size dumpster rental is perfect for cleaning out junk, small roofing projects, remodelling a kitchen, a bath renovation, small roofing projects (between 20-25 square of shingles), and even home construction projects. This roll-off dumpster is equivalent to approximately 3 pick-up truck loads of trash. A 15-yard roll-off dumpster container rental is perfect for commercial jobs. It will fit in a standard parking place. Smaller and lighter trucks allow Doty Trash Service to put your 15-yard roll-off close to the work zone. The 30 yard roll-off dumpster container is great when space is not an issue and you have lots of debris. This 30 yard roll-off container is large enough to handle lots of trash, junk, garbage or debris. This dumpster is perfect for commercial jobs, industrial sites and locations that have plenty of room. You may use this dumpster for multiple home improvement projects such as tearing off a patio deck or taking down a fence. 65 square or a light weight demolition such as: sheetrock and stud walls. This dumpster is equivalent to approximately 6 full-sized truck loads. This roll off dumpster will also hold up to 18,000 lbs. of debris. Please note that you cannot load heavy clean fill demo materials more than 1/3 full when using this dumpster. 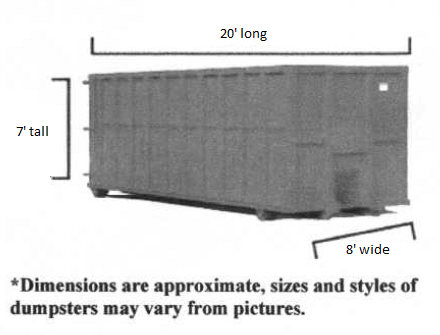 When choosing a 30 yard dumpster container, allow sufficient space for both the roll off truck and dumpster. The 40-yard roll-off dumpster container is great when space is not an issue and you have lots of light debris. This 40-yard roll-off container is large enough to handle lots of trash, junk, garbage or debris. This dumpster is perfect for retail, commercial, and industrial sites that have plenty of room. Please note that the sides are 7ft. high. This dumpster is suited for cleaning office complexes, new commercial job sites, retail build outs, and restaurant remodels. This dumpster is equivalent to approximately 8 full-sized pick-up truck loads. This roll-off dumpster will also hold up to 20,000 lbs. of debris. 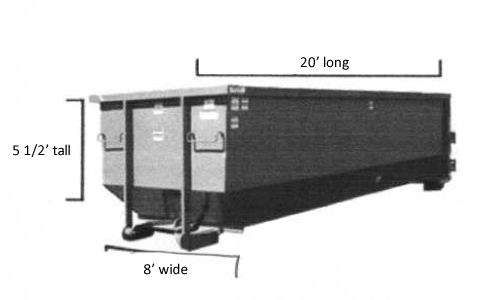 When choosing a 40-yard dumpster container, allow sufficient space for both the roll off truck and dumpster.